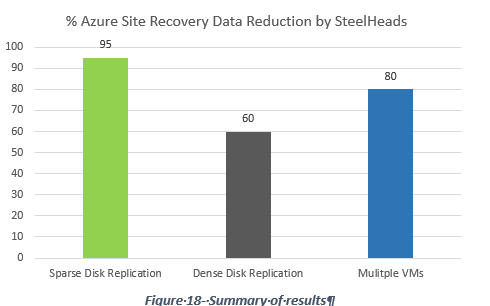 Microsoft just published a study that concludes Riverbed SteelHead ‘exceeds expectations’ for optimizing Azure Site Recovery. 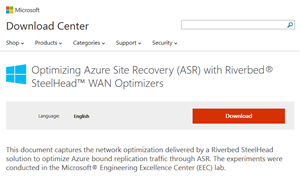 In this study, Microsoft paired an on-premise Riverbed SteelHead with an Azure hosted SteelHead CX to optimize Azure Site Replication traffic. This particular scenario is of keen interest to the growing number of customers using System Center Hyper-V Machine Manager as they can use Azure Site Recovery as an add on service to replicate Hyper-V machines into Azure. Should a local VM become unavailable, you can quickly bring the replica online.Of course, virtual hard drives tend to be on the large size. Replicating multiple virtual machines can easily direct terabytes of information into Azure. In addition, each replica is regularly refreshed also creating network traffic. Microsoft studied 3 key scenarios and found in each case the SteelHeads provided significant optimization as shown in the graph below. This is just one of the workloads that customers can now optimized using the Azure hosted SteelHead CX. Since HTTP’s optimization is a core feature of the SteelHead product line and traffic to and from Azure is based on HTTP, then optimization becomes possible for hosted SharePoint farms, web farms, web services, custom apps, file transfers any many other workloads. I’ll be posting more about about these scenarios in the near future.